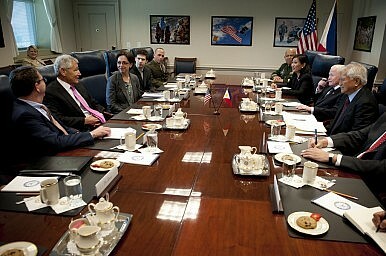 Manila should use the visit of Secretary of Defense Chuck Hagel to make clear where it stands. in Brunei he attended a meeting of regional defense chiefs—the rubber hits the road in the Philippines. The first U.S. Secretary of Defense to visit Manila since 2009, Hagel will arrive with a seemingly simple question for Philippine President Benigno Aquino: is Manila prepared to have a serious relationship with the United States? to deepen military-military ties to help the Philippines meet urgent defense needs, most visibly Secretary of State Clinton doing so aboard a U.S. warship in Manila Harbor in November 2011, there has been scant tangible progress. At the core of discussions between U.S. and Philippine officials has been identifying a mutually acceptable framework for an increased rotational presence of U.S. forces in the Philippines that accommodates Philippine political sensitivities. Facing increasing Chinese assertiveness in disputed waters and understanding that the Philippine Armed Forces are completely incapable of deterring the PLA, Philippine President Benigno Aquino recognizes that Manila's alliance with the United States is its only strategic asset. Yet, to date, he has been unwilling to wager the required domestic political capital to make the case that an increased U.S. military presence is in the Philippine national interest. For the United States, increased rotations of forces through the Philippines would go a long way toward realizing a more geographically distributed force posture in the Asia-Pacific region, a goal repeatedly articulated by Secretaries of Defense Gates, Panetta, and Hagel. Specifically in the Philippines, a sustained presence would provide the U.S. military additional training opportunities and better position forces in the case of a conflict or natural disaster anywhere in the Western Pacific. For the Philippines, a regular, overt U.S. presence would help deter potential Chinese threats to its sovereignty and make U.S. alliance responsibilities far more real. As it stands now, Beijing is skeptical of the seriousness with which the United States takes its alliance commitments vis-à-vis the Philippines—the United States putting skin in the game by funding infrastructure improvements to facilitate a more regular presence would change these assumptions. is striking how much more difficult these discussions have been with the Philippines. Despite the Philippines facing significant, immediate threats (unlike Singapore and Australia) and having an exceptionally weak military (unlike Singapore and Australia), senior members of the Aquino administration have shown little willingness to work expediently toward a mutually agreeable framework like those the Pentagon reached with Singapore and Australia. Instead, Aquino's feet have just been stuck in the mud, unwilling to work to move past the political legacy that forced the United States to close its bases in the Philippines in the early 1990s. While it is unlikely Hagel's visit this week will produce tangible results, it will be an important opportunity for Hagel to gauge whether Manila is prepared to have a serious relationship with the United States. With innumerable other demands on Hagel's time and resources, it would be wise for Aquino to be clear with Hagel and let him know whether the United States is wasting its time trying to modernize this 62-year old alliance. From August 2009 – July 2013, Brian Harding served in the Southeast Asia policy office in the Office of the Secretary of Defense. He can be reached at [email protected]. Plus, Chuck Hagel discusses the U.S. Offset Strategy, Japan plans BMD overhaul, and more. Mid-week links.